I love research, so it makes sense that I would appreciate a book that has over a thousand references. 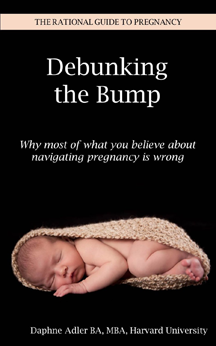 Debunking the Bump is authored by a mathematician who uses her skills with numbers to analyze the many risks and precautions associated with pregnancy. Recognizing that many women go through pregnancy frightened by warnings against common foods, beverages, and activities, her goal is to put those risks in perspective and reassure women that most of the time pregnancy proceeds well with good outcomes. The first two chapters, on pathogens and environmental toxins, were a little unsettling to me. Although her analysis of the numbers associated with the various germs and environmental toxins indicate that almost all fetuses will develop normally despite the potential poisons around us, I couldn’t help but be grateful that my own two sons are grown and successfully “launched.” I won’t be waking up worrying about the possible effects of air pollution and radiation on my growing baby, but a pregnant woman might, even though Ms. Adler counsels pregnant women not to worry about those things over which they have no control. I did appreciate her detailed discussion on listeria and was surprised to learn that, by far, the greatest threat comes from deli meat, rather than soft cheeses. According to Ms. Adler, the second most dangerous food source for listeria is pasteurized (yes, pasteurized) milk. My friends who love sushi will be pleased to know that Ms. Adler concludes that sushi is not only safe during pregnancy, but beneficial. I liked the chapters on voluntary toxins and lifestyle issues better. Ms. Adler’s analysis provides information that childbirth educators can share with their students to help students decide for themselves whether they feel comfortable enjoying an occasional cocktail or relaxing in a hot tub. I found Ms. Adler to be very up-to-date, with references as recent as 2013. I have to admit that, by this time, I stopped forcing myself to read all the copious footnotes. The detailed footnotes are valuable for the childbirth educator who wants to research a specific topic, but tedious for someone who is reading the book in its entirety. There are additional chapters that cover topics such as vitamins and minerals in the maternal diet, “The Mozart Effect,” obesity, and maternal age. Ms. Adler also provides a detailed description of her methodology. She does not include information on health care providers, birth locations, or any labor and birth issues. Ms. Adler has done her homework. Her book is especially useful for those who teach pre-conception and early pregnancy classes and will help any birth educator answer many of the tough questions asked in childbirth classes about pregnancy issues.